Rich deciduous forests and northern hardwoods, less often under pine, cedar, or other conifers. Often growing with one or both color forms of A. rubra. Readily distinguished from A. rubra in fruit, by its striking elongate raceme of porcelain-like berries on thick red stalks. In A. rubra, the raceme is more often compact and the pedicels remain very slender. Young flowering material, before the pedicels have begun to thicken, is more difficult to determine, although the peculiar tips of the petals are helpful (the sepals fall off very early). The broad stigma in A. pachypoda seems to be more clearly sessile (the style, if any, broad and thick beneath it) than in A. rubra, where the pistil tends to narrow somewhat beneath the stigma. Differences in leaf pubescence cannot be relied upon, although in A. pachypoda the leaves are more often glabrous or nearly so beneath, while in A. rubra there is usually at least some small pubescence along the veins beneath. A red-fruited form of A. pachypoda is known [f. rubrocarpa (Killip) Fernald] but seems to be very rare in Michigan, represented by one collection from Kent Co. 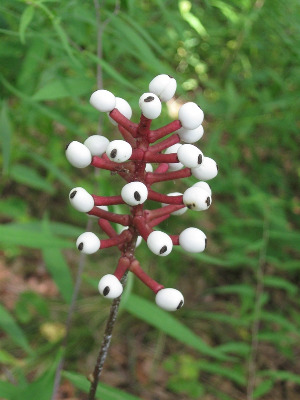 Specimens truly intermediate between the species are also rare but some hybridization occurs, producing Actaea ×ludovici B. Boivin. Suspected hybrids are known from Keweenaw and Oakland Cos., and doubtless occur elsewwhere. These hybrids are best discerned in fruit, and vary in berry color, as expected, but are often reddish berried, though often not as dark as those of A. rubra. They differ most clearly in having intermediate pedicel widths; proportionately longer and thinner than those of A. pachypoda and only dull reddish in color, but thicker, and with clearly thickened bases, than those of A. rubra. Live material in the field, where contrasts with the likely parents can be readily made, are the best way of detecting these hybrids. MICHIGAN FLORA ONLINE. A. A. Reznicek, E. G. Voss, & B. S. Walters. February 2011. University of Michigan. Web. 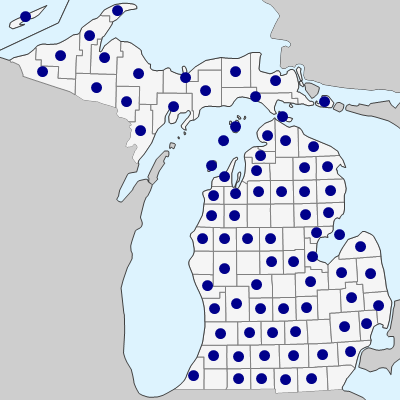 April 20, 2019. https://michiganflora.net/species.aspx?id=2355.